Last fall Rembukan members hosted a party at a “Ryotei”i of the sukiya-style at Kiyosumi garden. The structure appeared to hover over the stilled waters against a serene backdrop of manicured landscapes. The view was irresistible. For Yuri and I (we came here while courting almost 40 years ago,) the many subsequent visits had not diminished our appreciation for this place. To be cliché, this was and is our island of tranquility within the chaos of Tokyo. Kiyosumi ’s roughly circular pattern features manmade hills, water and stone elements. It is a surviving representation of one of the “Daimyo” gardens created during the Edo period when warlords were required to take up residence within the city of the Tokugawa rulers. Kiyosumi originated as part of the residence of a wealthy merchant named Kinokuniya. The rules must’ve been bent for this wealthy man as by caste it was not legal to own such land or to have a dwelling with a genkanii if you were not part of the then fixed bushi class. The property was later acquired by the Lord of Shimofusanokuni Sekiyado and changed hands again in 1885 in a rundown condition to Iwasaki, Yataro, also a wealthy merchant.iii Iwasaki wanted a place where he could entertain noble visitors and foreigners. The garden’s name became Fukagawa Shimbokuen. The water elements were expanded and stones brought from every part of Japan to make this garden into a Meiji styled paradise. Basho, the famous poet, had lived nearby and his most famous haiku immortalized on a stone tablet was moved to the park. Severely damaged during the Great Kanto Earthquake of 1923, the park was credited with saving the lives of the many people that fled there. 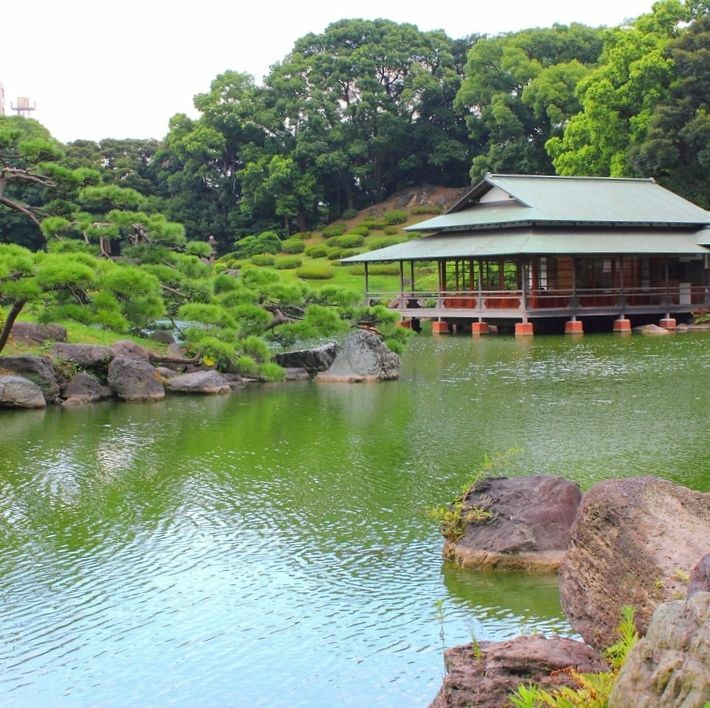 Recognizing this public value, the Iwasaki family donated half the park to the city of Tokyo at a time when public philanthropy was not widely practiced in Japan. Notables entertained here where we were hosting some wonderfully skilled Jo and Iai teachers included English Lord Marshall Kitchener who made a state visit in 1907. Only notable within our own minds, but very much aware of our surroundings, Rembukan members wore shirts emblazoned with the brush writing of a renowned Kyoto Zen priest. The message, “sen-shin” means to purify one’s heart, to begin anew. The setting, the Japanese craftsmanship of the wooden structure, the perfect angles at which the veranda boards met at the corners, and the sense of balance was appreciated by all of us, Japanese and Westerner alike. Egrets, koi, and turtles greeted us while offering up an illusion of a perfect setting within nature. Everything but the unpredictable movements of the wildlife was part of a planned order. The sun dipped behind the horizon and the last rays of the day shimmered over the pond. The view framed in from veranda and low lying roof allowed us time to imagine an ageless scene leading to a natural silence amongst all gathered there. Even the wait staff paused in what they were doing to take in the moment. For the most part our Japanese guests had never known of this park or come to explore its gifts. None had ever been entertained like this by non-Japanese. Upon learning of the original purpose of the park, a message of irony was not lost by those in attendance. 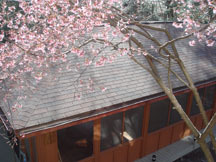 Westerners were hosting Japanese in Japan. Westerners were demonstrating through their behavior a level of respect and appreciation for Japanese tradition that is not commonly exercised within today’s generation of budo practitioners. Certainly, none of our guests had ever interacted on this level with non-Japanese before. Even before the beer started to flow, the Rembukan spirit of comradery became infectious and broke down cultural barriers, cementing the foundation for a healthy future relationship. In thinking about Basho’s poem, there is little doubt that the significance we place on this event will leave no permanent mark. By the same token, everything is connected to everything else and I’m left with the question of how will Jo and Iai look in another 100 years? Will ancient traditions wither away or will a sense of continuity prevail? The memory of Lord Kitchener’s visit, what was said, who was present is lost to the history books. After 300 years, the timelessness of a mere 17 syllables still resonates.iv In keeping with our poor dojo humor I’ll end by adding that again the pen will prove mightier than the sword. 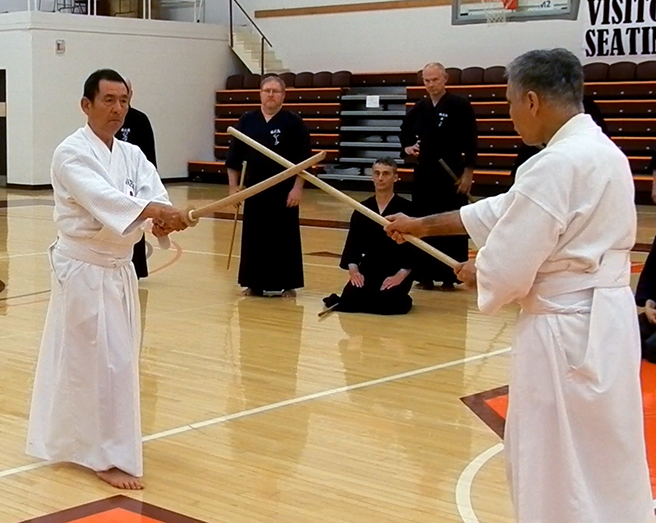 We enjoyed hosting Tsubaki & Hagiwara Sensei for our summer seminar. 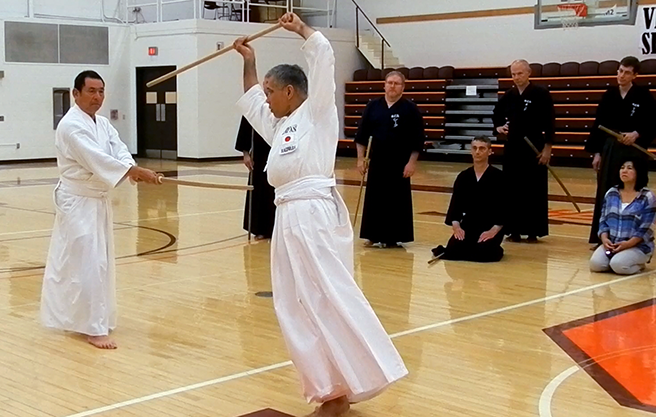 Here Ranai is being demonstrated. Cory, Jon, Ned, John & Yuri are caught be the camera looking intently. Their visit reflects on the Rembukan's desire to maintain its' Koryu stance while also using the seitei tools to improve skill sets and create a richer learning environment. This year we're looking forward to a repeat performance at Baldwin Hall. 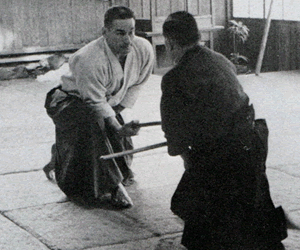 Draeger S. Performing Oku with Shimizu S.
Foreigners hoping to study Shindo Muso Ryu at the original Rembukan Dojo in Tokyo, Japan were interviewed by both Shimizu and Draeger Sensei. Donn was responsible for all non-Japanese students of SMRJ. Below is the text that each non-Japanese had to read and sign prior to being allowed entry into the dojo. This process was taken very seriously. Each student had a sponsor that the teacher would communicate through. Author's NOTE: My Sempai Bruce Brown's guarantor Mr. Horii and I met in April 2015 at the Tokyo Budokan. Still active within the Jodo Division of the Kendo Renmei, Horii San and I enjoyed coming full circle after all of these years. 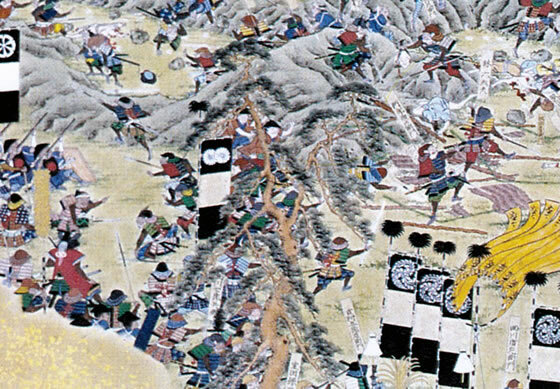 This is a battle painting of the Shimabarra Rebellion （１６３７）to suppress the Christians where Musashi was hit by a rock to the head in route to the battle. As a result he requested that he and his troops be allowed to withdraw. With the elimination of the foreign contamination the Tokugawa Bakufu moved to close the country that would eventually be pried open about 300 years later. This in turn brought about the downfall of the Bakufu and was the catalyst for the Meiji Reformation and Japan's drive for modernity. Shi (meaning teacher) Jyo (meaning to receive). Excerpts from: March 5th, 1992 lecture by the writer Shiba Ryotaro at Columbia University, Donald Keene Japan Cultural Study Center. Before the era of Modernization of Japan imposed by the Meiji government it was prohibited to go beyond the scope of the teacher’s thoughts. This could be viewed in every aspect of learning and was not limited to religion and scholarly pursuits but was found in medicine, art, and budo. “Code of Bushido” as Nitobe’s work “Hagakure” was managed by the Japanese militarist machine before the advent of World War II. So what was Bushi (warrior) life really like during the middle and late Edo (Tokyo) or Tokugawa (Clan name) period of Japanese history? 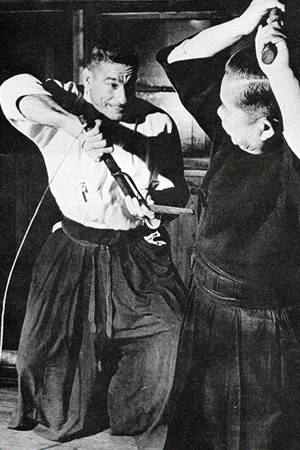 Documents clearly show that Shimizu Sensei made a conscious effort after World War II to change the name “Jojutsu” to “Jodo” in order to capture the essence of training for self-improvement. The nuanced goals might’ve been amended but the actual martial system was not adjusted in any meaningful way as some would argue that the techniques were then watered down. The Rembukan Dojo’s short decade long life was at an end due to a family tragedy of the owner of the property and friend of Shimizu Sensei. And although Shimizu Sensei had visited and approved of the Zoshyukan’s rented space, he never trained there succumbing to illness and death a short time later.